Don�t you just love the Beautiful Game! While it was a nuisance for Tottenham, you must have ice in your veins if you were not warmed by yesterday�s last-minute equaliser by Rochdale. It gives the rock-bottom Division 1 minnows a much-needed cash bonanza, and keeps alive the magic of the FA Cup. Tottenham have become the Robin Hood club of the competition, helping hard-up clubs with replay hand-outs. Priority for Professor Pochettino is, of course, next month�s European Champions� League duel with Juventus at Wembley, and the last thing he wanted was an extra FA Cup tie crammed into the fixture list. His cups are overflowing. But Rochdale worked hard for the draw and their players will feel ten feet tall when they run out at Wembley, most of them for the first time in their lives. Pochettino was on a hiding to nothing with his team selection. If he�d played his strongest side and one of the key men had got crocked, he would have been crucified by the couch coaches. He went for what in the first half seemed a team of passing strangers, and Rochdale thoroughly deserved their half-time lead. The Poch made a few tactical tweaks and there was a huge improvement after the interval, as our guru Paul H. Smith records here. But it was not until the cavalry arrived in the shape of Lamela, Alli and Kane that Tottenham really took control. Before that we got further worrying evidence that Llorente is a striker out of the Soldado/Janssen school. Like his two failed predecessors, he looks the part but the end product is pathetic. Who would have bet on Rochdale surviving after Harry�s late penalty? It keeps him in line for scoring in every round if Tottenham make it to the final. That would be the first time since Peter Osgood achieved it for Chelsea back in 1970. Rochdale�s last minute equaliser by Steve Davies was deserved, even if it was aggravating for Spurs as they set their sights on the Champions League. Hands up if you agree with me that the FA Cup draw should have been left until the traditional Monday? It has robbed the competition of that extra excitement. As I thought, a forest of hands have gone up! Something we learned yesterday is that Toby Alderweireld is well short of big match sharpness, and so Pochettino was justified in leaving him at home for extra training rather than going on a passenger journey to Turin. We can expect a tight match in the second leg of the Champions League tie. Juventus will come looking for an early goal and then hiding behind a catenaccio defensive system that will make the parking of the bus by Premier League teams seem like playground tactics. They are rather good at it, so don�t think this tie is done and dusted. Remember the three Ps: patience, patience, patience. 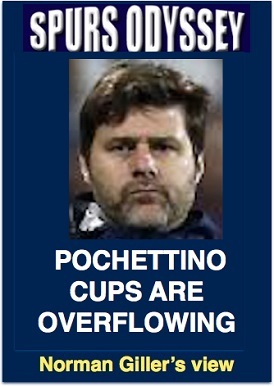 That advice also goes to Pochettino as he considers his personal future. Daniel Levy is ready to (rightly) make him one of the highest paid managers in the Premier League as PSG and Real Madrid look admiringly in Poch�s direction. It�s going to be a long season. WEEK 27 of the Sports Odyssey Quiz League 2017-18. The rules are simple: I ask one Tottenham-related question for which a right answer earns you two points, and then a related teaser that can bring you an extra point. Who was born in Enfield, won 11 England Under 21 caps and joined Tottenham from Coventry? What number shirt did he win in an FA Cup final appearance for Spurs? Please email your answers by Friday�s midnight deadline to: soql27@normangillerbooks.com. Question 26 was: Who won 79 caps for his country, scored 21 international goals and moved from Spurs to Wolves? Against which team did he score the winning semi-final goal that took Tottenham to the 1999 League Cup final? Most of you came up with the correct answers: Steffen Iversen who scored v Wimbledon away in the 1999 League Cup semi-final. Please give me what you think is your points score to date, so that I can check it with my list. I am going to have to dream up a particularly fiendish tie breaker to sort the log jam at the top of the table in the closing weeks of what is becoming a memorable season. First name drawn from the correct answers: Martin Wilson, who lives in Chichester and has followed Spurs for more then 30 years. I will send Martin a screen version of my Spurs �67 book (I have now sold all copies, and the book raised �4,000 for the Tottenham Tribute Trust to help our old heroes Thank you all those Spurs Odyssey followers who gave their support).